Music & Video Samples - Click on "Media Gallery"
Drawing on the diverse musical backgrounds of its band members, Shannon Lambert-Ryan & RUNA brings a contemporary and refreshing experience to traditional and more recently composed Celtic material. Through their repertoire of both highly energetic and graceful acoustic melodies, along with their fusion of music from Ireland, Scotland, Shetland Islands, Canada, and the United States, this vocal and instrumental ensemble give their traditional songs and tunes a fresh sound. 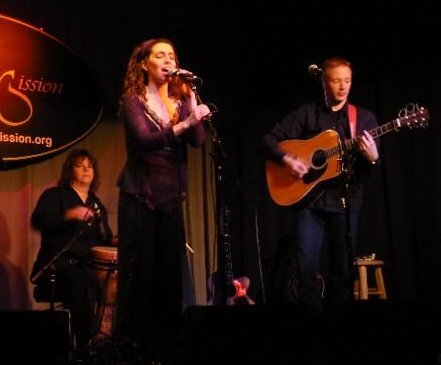 Coming from a variety of musical backgrounds including Celtic, folk, classical, and musical theatre, Shannon Lambert-Ryan, of Philadelphia, fronts the band with rich, vibrant vocals, and gentle piano playing. As a musician, she has spent the past two years as the lead female vocalist in the world music group, the Guy Mendilow Band. Additionally, she has performed as a vocalist with a number of artists, including John Flynn, Joe Jencks, Iain Campbell Smith, and Bob Beach. With his innovative style of rhythmic playing, Dublin-based guitarist Fionán de Barra, of Moya Brennan and Fiddler’s Bid, contributes new dynamics both to the band’s high-energy tunes and its captivating ballads. On fiddle, Kevin Henderson, of Boys of the Lough, Fiddler’s Bid, and Session A9, layers the music with his haunting tone and the infectious spirit of the Shetland style. The vocals and guitar playing of Stuart Eaglesham, of the Scottish folk-rock group, Wolfstone, lend a contemporary edge to the traditional sound of the band. Canadian percussionist, Cheryl Prashker, of The Strangelings, brings a wide range of percussive styles to the music, increasing the versatility of the band’s arrangements.